The new regime of "survival"
- You will have to wait until you are evacuated from the "dark areas" and to overcome the cold, hunger, thirst and disease without the usual equipment in a real storm. Look for warm clothes, useful tools, food, drinking water and medicines - without it you will not survive. But this is not vse.Osteregaytes other 23 agents and hunters who can trap you every povorotom.Tolko so you will be able to find a cure and get a reward for the successful execution of the job. - New York is dominated by a snow storm. It costs nothing to freeze to death in minutes. Seek shelter, move quickly from one point, where you can warm up to the other and produces warm clothes to resist the cold as long as possible. - You will have to look for food, because hunger will not allow itself to forget. Search the stores to find canned or other products - so you can fill the reserve of health. Find drinking water is no less important, because in the dewatering your eyesight will deteriorate. - Look for the drug to prolong his life and fight with septic shock. 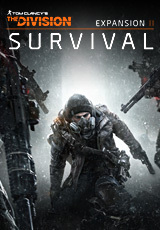 - In addition, "Survival" mode you have access to PvP or PvE. In cooperative play in PvP mode, you will be able to unite with friends or to act against the other players, even if they are outside the "Dark Zone", and selecting PvE you can only work in a team. - The new enemy, Hunter, moved quickly and act professionally. He has specialized training and his goal - to destroy the riot agents. So be careful and think about every step. - Carry out the actions necessary to survive in harsh conditions, and be careful in choosing allies. If your character is killed, it is necessary to create a new - a second chance will not. You can save the results or manufactured items only with a successful evacuation. If the agent is killed in the quest, you will get a reward depending on the survival of the account, which is the sum of the actions of the character.